The PADI Wreck Diver Specialty course introduces you to the skills and knowledge necessary for safe and fun wreck diving. The excitement of exploring a sunken ship or airplane is hard to match. 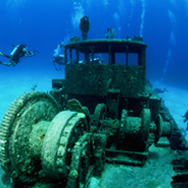 Wrecks of many types can be found in Minnesota and around the world. Wreck penetration-training is limited to the "light zone" and within 130 feet to the surface (vertical and horizontal distance combined). Use of lights, line reels, etc. The PADI Wreck Diver course includes one class session and four open water certification dives. Prerequisite: PADI Adventures in Diving (or qualifying cert. from another organization) and 15 years old. Includes: PADI Wreck Diver manual and certification processing. Students should also have a dive light (primary and a backup recommended) and slate for class. Read the PADI Wreck Diver manual and complete the knowledge reviews. You also need to complete a PADI Student Record File (which includes a Medical Statement). If you answer yes to any of the medical history questions, we must require a signed physicians approval before you participate. You can download and review the PADI Medical Statement here. Please print a copy to take to your physician for their approval and signature if required. Wreck Diver Schedule: Class: Thurs. evening 7 - 10pm, Dives: Sat. and Sun. Wreck Diver class session is held at our store in Eagan, Minnesota. Dives will be on the wreck of the Madeira in Lake Superior. The Madeira was a 436 ft steel hull ship that ran into Gold Rock just north of Split Rock Lighthouse during the storm on November 4, 1905. It lies in 20 to 110 ft. of water and is probably the most popular wreck dive in Minnesota. Several options for lodging can be found in the Two Harbors and Silver Bay area or further south in Duluth.